Many people question whether the elderly should keep their drivers license, but they didn’t always have the research to back up their doubts. Now they do, thanks to a study conducted at a Hospital in Rhode Island. 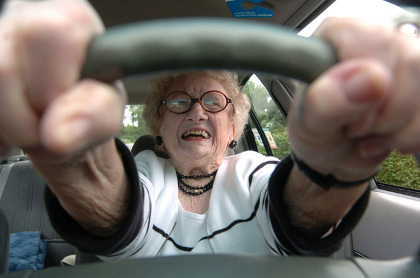 Their research has demonstrated that driving skills get worse as individuals get older. Everyone can expect some decline, but those with dementia and other disorders will see even more dramatic differences. The research was done in two separate parts. First, the elderly participants were asked to complete a knowledge test. Anyone who has applied for a license for the first time should remember the Rhode Island permit test. It quizzes testers on the meaning of road signs and asks them how they react under certain situations. The participants in the study took the standardized test, but they were also asked to allow video cameras to record them in their cars. The video cameras remained there for two weeks. Can Anxiety Make Driving Worse? The researchers gathered a lot of interesting data from the experiment, particularly on the driving habits of the elderly Rhode Island drivers license holders. One researcher remarked that the driving habits of the elderly are very consistent compared to younger drivers. The elderly tend to drive shorter distances, stay near their houses, and drive only during the daytime. These habits can be safe by themselves, but the anxiety that the researchers produced with their test seemed to have a large impact on the way the test participants drove. There were 103 participants in the study, and their reactions were tested over a series of different situations. One of the most interesting things the researchers discovered was that there was a significant decline in performance when the elderly were asked to drive a car other than their own. Driving in a strange car made the participants much more nervous, and their performance suffered as a result. Another interesting part of the study was the performance of those who suffered from cognitive disorders like dementia and Alzheimer’s. These participants had many more errors than the non-impaired participants, but where they made errors was particularly interesting. The impaired drivers were actually better at driving than they were at taking the written test, so while they would easily pass the Rhode Island drivers test, they would have failed the knowledge exam. Researchers suggested that this may be because a written test requires more thought and concentration than simple driving. The lead researcher went on to reassure people that the elderly did very well overall despite more common errors than other age groups. Most of the people who participated drove without causing any danger to anyone. Those with cognitive disorders did worse, but not to the point of being significantly more dangerous. In the end, the lead researcher felt that drivers license revocation as a consequence for an Alzheimer’s diagnosis was going too far. She pointed out instead that it is the responsibility of the people who care about the elderly to keep an eye on their driving and make sure that the elderly have the dignity of independence for as long as possible.